Public defenders please give us 48 hours' notice to pick up disc(s). **There are disc(s) available. 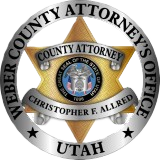 If you are interested in receiving them you will need to PRE-PAY $25 to the Weber County Attorney’s Office. Once this is received in our office the disc(s) will be available for pick up within 48 hours. Contact Rebecca Jackson rjackson@co.weber.ut.us or 801-399-8377 with questions.